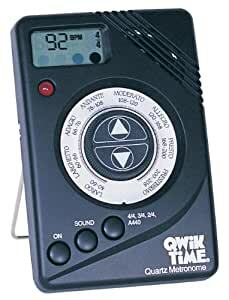 The QT7 Quartz metronome operates in 2/4, 3/4 and 4/4 and it's distinctive click will surely cut through any style of music. With an adjustable tilt stand, it will fit easily on a desktop, music stand or table. Since I'm a keyboard player I need a metronome that can be heard above all-out playing on a grand piano, so the loudness of this one is a plus as far as I was concerned. Otherwise, it has all of the basic features one would need, including an A-440 tuning note, and the price can't be beat (no pun intended). Some noticeable drawbacks: first, although you can set the meter to duple, triple or quadruple, the different tone for the downbeat can't be disabled--i.e. you're forced to choose a meter. I have to say I find it easy to ignore the downbeat tone being in different places if one is practicing something that changes time signature, but someone else might not. Second, I had to replace the first one I bought when it failed after being dropped only a few inches from the music rack onto the piano strings--even something this cheap should be a little more durable. Finally, the push button on-off switch means that the thing can (and has, in my case) turned itself on when stuffed in a carry-on--an electronic beeping is not a good thing to hear on a crowded airplane :-). Otherwise, I'm perfectly happy. I purchased this metronome to use as an aid while I walk for exercise. I like to walk to a steady beat. It works fine for this purpose. 1. I can't control the volume of the beat. It's very loud and hurts if I put my earphone all the way in my ear. 2. Notice that I said "earphone". The beat only comes out of the left earbud. This is not a problem for my use, but might be irritating to some. 3.0 out of 5 starsWorks. Bought it cause I don't use metronomes that much and just wanted a cheap one. It works, although you could say it's a little old fashion. For a cheap solution, this is perfect, but if you want more control, I would recommend looking somewhere else. Not too loud and the light is not too bright. Normal, functional metronome that is great for it's price. Works with AAA batteries, no volume control. Basic metronome, ideal for begginer students or as a cheap solution for your metronome needs. Looks like it will last long enough without any problems. This device works well, purchased for my wife who needed one while she is learning to play a piano, her teacher loved it and will probably purchase one as well or one like it. It was packaged well, arrived very quickly, weeks before it was supposed to by the shipping time estimates or allowances, communications with the vendor were replied to quickly as well. Bottom line, Good product from an excellent vendor, forgot to mention this vendor had the lowest price in all of my research too. 5.0 out of 5 starsKeeping time! I Love this device. I have an older version that's falling apart and still works, but it was time for a new one. I love the new design and they've added headphone and output jacks on the back with volume controls. The description said it would return to 100 bpm every time you turn it off but it doesn't, It remembers what tempo you last set it at. Great deal.You'll love it too.